Walk through using intraoperative abberometry to choose an IOL power. When placing a CTR, inserting toward intact zonules is optimal. I prefer the use of an insertion device over a manual technique for clean entry. The bag must be fully expanded with OVD. Attentive proprioception allows the surgeon to sense if the leading haptic is making the curve without pressure on the bag equator. In this video one can appreciate the subtle bowing backward of the arc of the ring causing me to withdraw it into the inserter and opt for a fool-proof way to avoid all zonular stress. A 10-0 nylon suture is threaded through the leading eyelet and the two ends are held with forceps outside the eye with the dominant hand. This tether allows the CTR to be extruded from the inserter held with the nondominant hand while controlling the curve and vector of the ring. Any zonular impact is eliminated and the suture acts like a tracer indicating the progress and position of the leading end. The suture could be used to remove the CTR in the rare event of a major capsular tear. Once comfortably positioned the suture is cut and removed. 1 mm fibrotic pupil in a two-time post-vitrectomy patient with dense cataract, zonular dehiscence and fibrotic anterior/posterior capsule. 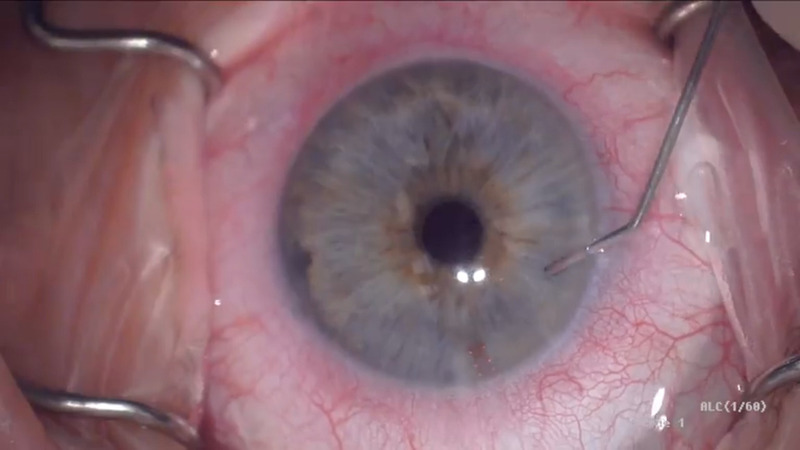 Prior to the start of the video, I incised the iris sphincter in three locations to enable a larger postoperative pupil. I chose to use the X1 Iris Speculum from Diamatrix to help enlarge the pupil and help break the fibrotic bonds. The video highlights the ease of insertion and the stability of the device. An anterior chamber lens was implanted and a posterior capsulotomy performed the following day. This is a woman with a dislocated lens/bag complex and pseudoexfoliation glaucoma. A decision was made to remove the lens/bag complex and do double needle intrascleral haptic fixation of an Aaren EC3 Pal with a Kahook Dual Blade goniotomy. One week postop the vision was 20/20-2 uncorrected and refraction was plano-0.5X 15. I chose not to lasso the Akreos because of concerns about lens opacification that can occur with hydrophilic acrylics in complex cases. This is a patient with pseudoexfoliation and glaucoma who had a successful combined phaco trabeculectomy with mitomycin-C done by me 4 years earlier. His pressure had been in the 30s on medication prior to surgery and between 8 and 10 since then consistently, so we couldn't risk sacrificing the bleb. He presents with a dislocated lens/capsular bag complex, and by the time we got him to the OR, there is vitreous in the anterior chamber and the lens has sunken significantly into the vitreous cavity. The lens is floated up with viscoelastic so that it can be lassoed on one side, then the other side, taking care not to damage the bleb. The proximal side is lassoed again incorporating both ear like haptics as initially the lens did not center well. Gore-Tex CV-8 suture was used here with a TTc -9 needle bent with needle holders into a more useful profile. After completion of the securing of the IOL/bag complex a pars plana vitrectomy is carried out. The next day the IOP was 12, and the implant was well centered. Pseudoexfoliative eyes do not do well with lens rotation as the zonules tend to release from the lens. Dr. Young demonstrates a technique he developed to extract the lens without rotating the nucleus at all. This video demonstrates the alignment of a Tecnis mulitfocal IOL to the visual axis of the patient using the Verion intraoperative digital marking and guidance system. Michael Knorz, MD, presented the best cataract papers at the “Best of ASCRS” session at the 2017 ASCRS•ASOA Symposium & Congress. Pre-Descemet’s endothelial keratoplasty (PDEK) is the latest entrant in endothelial keratoplasty. It has the advantages of DMEK (being thin, 25 microns) and DSEK (easy to do). The biggest advantage is physicians can use young donors. In PDEK, physicians use the TACM to get continuous infusion of air through the TACM to help in air-assisted PDEK. To master PDEK, physicians should know the 15 steps of performing it. This video shows the stepwise method of performing the surgery. This is a patient referred in with a toric IOL 75 degrees off axis that also had severe pseudophacodonesis and a dehiscence of the capsular bag from 6:30 to 11:00. The lens is rotated to the proper position, and the bag is secured with two Gore-Tex sutured capsule tension segments. An iStent is placed during this procedure as well. Dr. Radcliffe presented the best glaucoma papers at the “Best of ASCRS” session at the 2017 ASCRS•ASOA Symposium & Congress. Elizabeth Hofmeister, MD, highlighted the best refractive papers at the “Best of ASCRS” session at the 2017 ASCRS•ASOA Symposium & Congress. The papers were chosen from the Best Paper of Session winners. John Hovanesian, MD, highlighted the best cornea papers at the “Best of ASCRS” session at the 2017 ASCRS•ASOA Symposium & Congress. The papers were chosen from the Best Paper of Session winners. In this video, Dr. Gulani shares the steps taken to eventually do a cataract surgery, which the patient would need anyway. By designing the preoperative stage to result in a measurable cornea for the highest accuracy, he is able to plan a predictable endpoint for the patient’s vision. Single-pass four-throw (SFT) pupilloplasty is a novel method of performing pupilloplasty. In this procedure, a helical structure is created. One can use this in cases of traumatic mydriasis. It can also be used in closed-angle glaucoma cases as it would help open the angles by narrowing the pupil. This is a patient who had a frayed iris after cataract surgery and was referred in for repair. She was bothered by glare and the cosmesis created by the defect. The frayed area was over sewn during which a buttonhole developed and threatened to extend the problem more peripherally. This video demonstrates the technique of repairing the problem. Timothy P. Page, MD, demonstrates with slow-motion, high-definition video, the time required for an anterior capsule to tear-out during attempted manual capsulotomy. This complication, known as the "Argentinian Flag" sign, is contrasted with sub 1.2 second capsulotomies performed with femtosecond laser. The video advocates the use of femtosecond laser for the intumescent cataract based on the speed of creating a capsulotomy and avoiding an anterior capsular tear-out. This is a woman who has persistent disturbing negative dysphotopsia (ND) in her left eye after cataract surgery a year earlier with an Akreos A060 implant placed in the capsular bag. She has a history of pseudoexfoliation syndrome and the implant is well fibrosed in place. A lens exchange for a 3-piece silicone lens placed with the haptics in the bag and the optic in the sulcus (reverse optic capture configuration) is performed with subsequent and immediate complete resolution of her ND symptoms. Robert Noecker, MD, highlighted the best glaucoma papers at the “Best of ASCRS” session at the 2016 ASCRS•ASOA Symposium & Congress. The papers were chosen from the Best Paper of Session winners. This is a cataract surgery combined with pars plana vitrectomy for a 20-year-old male who had penetrating trauma to the eye and through and through perforation of the lens previously. Boris Malyugin, MD, highlighted the best international papers at the “Best of ASCRS” session at the 2016 ASCRS•ASOA Symposium & Congress. The papers were chosen from the Best Paper of Session winners. This is a posteriorly dislocated toric IOL capsular bag complex after pars plana vitrectomy retina detachment repair that is replaced with a GORE-TEX sutured one-piece PMMA IOL through a self-sealing scleral tunnel incision. Neel Desai, MD, highlighted the best refractive papers at the “Best of ASCRS” session at the 2016 ASCRS•ASOA Symposium & Congress. The papers were chosen from the Best Paper of Session winners. Abundant, adherent fused cortex is the result of femtosecond nuclear softening and capsulotomy creation. This change in the cortex alters its properties enough that standard irrigation/aspiration techniques may be challenging. This video demonstrates a simple irrigation technique that exploits these adherent properties and can safely and effectively remove cortex and polish the capsule. This video shows the use of the Zepto Precision Pulse Capsulotomy device both on the anterior and posterior capsules of an ex vivo rabbit with optic capture into Berger's space. Richard Tipperman, MD, highlighted the best cataract papers at the “Best of ASCRS” session at the 2016 ASCRS•ASOA Symposium & Congress. The papers were chosen from the Best Paper of Session winners. In this case involving a high hyperope who suddenly moved at the end of his cataract procedure and experienced a capsular bag dehiscence with dislocation and vitreous prolapse to the wound, a pars plana vitrectomy is performed along with repositioning of the capsular bag/IOL complex with placement of a CTR and finally retearing of the capsulorhexis. Residual cortical material in the bag was removed as well. The IOL is a 1-piece 31 D ZCB00 (Abbott Medical Optics), and it is successfully recentered and stabilized with these maneuvers. This video demonstrates phacoemulsifcation of a dense, coal black cataract in a 95-year-old patient. The technique of “reverse slope sculpting” combined with chopping is used to segment and remove the lens safely. This is an extremely leathery lens with a very adherent, dense posterior plate and requires aggressive maneuvers to segment it safely. An LRI is done at the end of the procedure to reduce astigmatism. Blood reflux from the collector system into Schlemm's canal and then into the anterior chamber through the stents is a sign of proper stent positioning, and may be a good predictor of future IOP lowering. The blanching of the episcleral vessels seen here when performing irrigation and aspiration is also a very positive sign and when absent should prompt the surgeon to reposition the stents. The Zepto capsulotomy device used in a human clinical subject. This is a young man with a history of trauma to the OD. He had cataract surgery a few years earlier but has severe glare due to a fixed dilated pupil and scratches in the center of the lens optic. He has had extensive YAG capsulotomy as well. Here, the IOL will be exchanged for a 3-piece silicone lens, pars plana vitrectomy will be performed, and an iris cerclage carried out. In this video, we describe the surgical technique for identifying the upper interface of a SMILE lenticule if the lower interface has inadvertently been separated first. The technique involves simply inserting a Sinskey tip sideways into the small incision, rotating the tip upward to engage the lenticule edge, and moving the tip in a nasal direction to release the lenticule edge. The upper interface can then be separated as normal. The subsequent cataract surgery that was done 1 year after the PK in the “Penetrating keratoplasty in buphthalmic eye” video. The procedure proceeds uneventfully until the insertion of the CTR causes a split in the capsular bag from posterior to anterior. A decision has to be made where to put the IOL as sulcus placement in such a large eye will likely not be stable. The lens is manipulated into the capsular bag and dialed into a stable position. No vitrectomy was required. Penetrating keratoplasty performed in a monocular patient’s buphthalmic eye. This is a large 8.75 mm graft, and despite the phakic status, Dr. Safran chose to use a Flieringa ring to provide needed structural stability during the procedure. Note the markedly thickened Descemet’s membrane removed separately after the stroma was removed. The running suture is adjusted to reduce astigmatism. This is a 40-year-old man with a pterygium causing significant astigmatism, visual and cosmetic problems. We performed pterygium removal, conjunctival autograft using fibrin glue to secure the graft and mitomycin-C application. The procedure is done under topical anesthesia (lidocaine gel), and throughout the procedure the patient is able to assist me by moving his eye in the direction required. Uneventful iStent placement in Schlemm’s canal leads to recurrent hyphema after surgery. Ehud Assia, MD, highlighted the best international papers at the "Hot Off the Press" session at the 2015 ASCRS•ASOA Symposium & Congress. The papers were chosen from the Best Paper of Session winners. Husam Ansari, MD, highlighted the best glaucoma papers at the “Hot Off the Press” session at the 2015 ASCRS•ASOA Symposium & Congress. Here are the abstracts from the studies, with Dr. Ansari’s comments regarding selection. Dr. Agarwal has devised a new device for infusion called the Trocar AC Maintainer (T-ACM). The T-ACM enters at the sclera level above the iris and gets locked onto the eye like the retinal trocar so it is easy and safe to use. Anterior segment surgeons can use this for cases with PC rupture, iris suturing, IOL suturing, glued IOL, etc. Cornea surgeons can use it for endothelial keratoplasty where they can connect it to an air pump to have continuous air in the AC to help fix the DESK/DMEK or pre-Descemet’s endothelial keratoplasty (PDEK) graft. The T-ACM is easy to use and is available in 23 g, 25 g or 27 g depending on the surgeon’s preference. Bennie H. Jeng, MD, highlighted the best cornea papers at the “Hot Off the Press” session at the 2015 ASCRS•ASOA Symposium & Congress. The papers were chosen from the Best Paper of Session winners. Richard Tipperman, MD, highlighted the best cataract papers at the “Hot Off the Press” session at the 2015 ASCRS•ASOA Symposium & Congress. The papers were chosen from the Best Paper of Session winners. This video demonstrates the exchange of a Toric IOL placed one year earlier in a keratinous patient for another lens of different power placed on a slightly different axis. The capsular bag is re opened, the IOL removed and a new IOL placed on the correct axis. Using the Catalys precision femtosecond laser (Abbott Medical Optics), Dr. Younger shows modifying centration of the capsulotomy due to the density of a mature white cataract. This case was performed in 2008. It is a 50-year-old woman with Fuchs’ heterochromic iridocyclitis and glaucoma. She had cataract surgery in this eye 20 years ago and a more recent mitomycin trabeculectomy performed at 12:00 superiorly. Her 1-piece PMMA IOL is inferiorly dislocated and also damaged by YAG laser pitting. There is very poor capsular support. A decision was made to exchange the lens and scleral fixate the new IOL with an aggressive pars plana vitrectomy done to remove significant vitreous inflammatory debris in the hope of reducing chronic inflammation and improving vision. A temporal approach was used because she had more than 3 diopters of against-the-rule astigmatism and to avoid disturbing her filtering bleb. Note the importance of a self-sealing scleral tunnel incision to maintain control of the eye throughout the procedure with the pars plana infusion cannula in place. Also note that a 25-gauge infusion line was used with 20-gauge vitrectomy with excellent fluidics throughout the procedure (bottle height was at 80 during vitrectomy and lowered to 40 when the vitrector was removed). 9-0 prolene was used to secure the haptics in this case. Elizabeth Hofmeister, MD, highlighted the best refractive papers at the “Hot Off the Press” session at the 2015 ASCRS•ASOA Symposium & Congress. The papers were chosen from the Best Paper of Session winners. This is a patient who developed a severe Z syndrome 5 months after FLACs. She was referred to my practice after there was no improvement with 3 aggressive YAG laser treatments done to the central and peripheral posterior capsule. She had 5 diopters of lenticular astigmatism caused by the tilted optic, and a decision was made to do a lens exchange with pars plana vitrectomy. During the procedure a radial tear developed in the anterior capsule rim when it was put under tension with iris retractors, and this was despite the fact that there was an intact ring of phimosis. One can see in the video the intact anterior capsule rim, which is a fibrotic phimotic band of contraction and a radial tear that develops in the underlying capsule beneath this intact rim when the opening is placed under stretch. The radial tear precludes optic capture as an option and necessitates complete removal of the inferior plate to prevent it from migrating centrally with time, and a decision was made to place the new lens in the sulcus with one haptic sutured to sclera to prevent decentration given the presence of zonular instability in the region of the inferior haptic. This patient did very well with 20/20 vision with a low myopic –0.75 correction as planned. This video demonstrates the “3-handed” insertion technique for the Aaren EC3 PAL lens for the intrascleral haptic fixation or “glued in” IOL technique. This IOL is almost ideally suited for this technique as it has a 6 mm hydrophobic acrylic optic that has zero spherical aberration and is less affected by tilt and decentration than many other designs; in particular, it has haptics made of a unique material, polyvinylidene fluoride, that makes them almost indestructible and bendable without breaking. While the surgeon holds the injector in his right hand and uses his left to grasp the haptic, the surgical assistant turns the screw on the injector to advance the lens. After the first haptic is externalized, the “Safran microbulldog” silicone assistant is used to hold the haptic while the second haptic is externalized through a second ostium exactly 180 degrees apart from the first one. This guarantees good centration and avoids tilting of the optic. An IOL exchange for UGH syndrome caused by a completely in the bag 1-piece acrylic IOL. Because of extremely loose zonules iris retractors were used to stabilize the capsular bag. After removal of the IOL, the bag collapses and an attempt to reform it with a CTR results in the CTR passing through defects in the capsular bag where the haptics were positioned. This suggests the possibility that the haptics had eroded through the capsular bag. 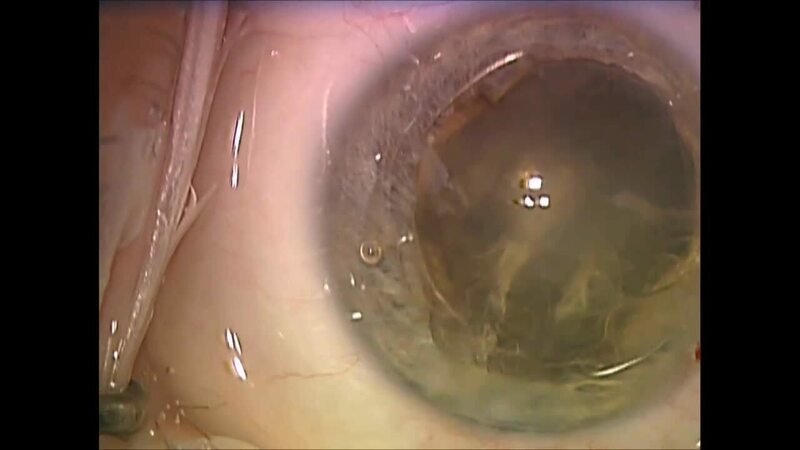 A decision was made to perform a pars plana vitrectomy, remove the collapsed capsular bag and do an intrascleral haptic fixated 3-piece implant instead. A new technique for surgery with dense cataracts called "femtosecond ultrachopper assisted cataract surgery" is shown here. This video shows iris fixation of an IOL utilizing both a modified Siepser sliding knot and McCannel suture technique. Husam Ansari, MD, PhD, highlighted the best glaucoma papers at the “Hot Off the Press” session at the 2014 ASCRS•ASOA Symposium & Congress. The papers were chosen from the Best Paper of Session winners. Here are the abstracts from the studies, with Dr. Ansari’s comments regarding selection. This video demonstrates a new technique of glued capsular hook to attain a glued capsular bag. This allows sutureless fibrin glue assisted transscleral fixation of the capsular bag. It is essential that precut donor cornea and recipient have apposition allowing for the tissue planes to accurately align. We initially suture with 4 cardinal 8-0 working silks carefully placed between the base of the anterior side cut and the take off of the lamellar ring cut. Corresponding passes through the recipient are placed allowing a lock and key effect created by the zigzag Intralase template. This assures that the remaining 10-0 nylon suture placement will follow accurate tissue plane placement. Boris Malyugin, MD, highlighted the best international cataract papers at the “Hot Off the Press” session at the 2014 ASCRS•ASOA Symposium & Congress. The papers were chosen from the 2014 ASCRS Best Paper of Session winners. Susan M. MacDonald, MD, highlighted the best cataract papers at the “Hot Off the Press” session at the 2014 ASCRS•ASOA Symposium & Congress. The papers were chosen from the 2014 ASCRS Best Paper of Session winners. This is a patient with pseudoexfoliation syndrome who has a loose capsular bag complex with a CTR in it. The IOL is damaged centrally with 3 large pits in the optic. An IOL exchange is performed by stabilizing the capsular bag with iris hooks and then fixating it to sclera with a CTS and a lasso suture. The patient had a small amount of vitreous heme that cleared within the first week postop. Bennie H. Jeng, MD, highlighted the best cornea papers at the “Hot Off the Press” session at the 2014 ASCRS•ASOA Symposium & Congress. The papers were chosen from the Best Paper of Session winners. John Berdahl, MD, highlighted the best refractive papers at the “Hot Off the Press” session at the 2014 ASCRS•ASOA Symposium & Congress. The papers were chosen from the Best Paper of Session winners. 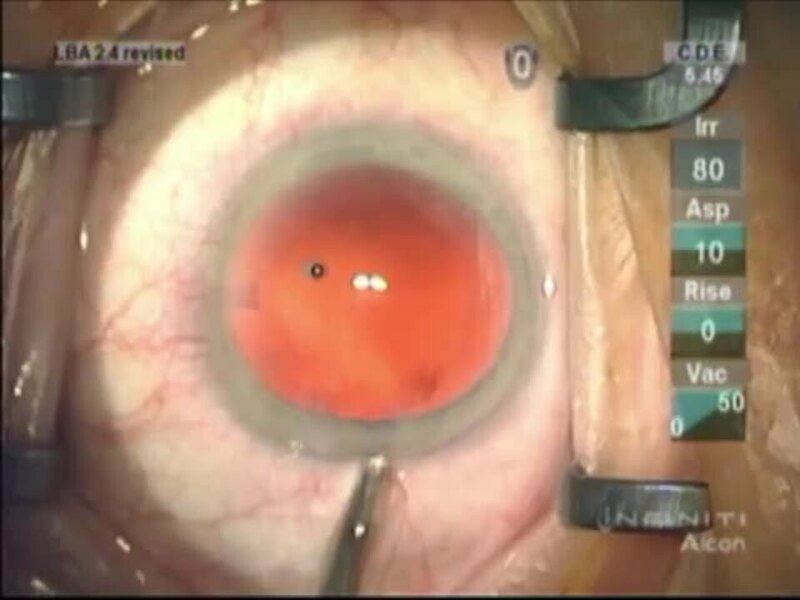 This video shows the implantation of a 3-piece IOL following cataract surgery with hyaloid sparing posterior capsulorhexis with haptics in the sulcus and optic captured through both the anterior and posterior capsular openings into Berger's space. Alcohol removal of the epithelium for treatment of residual mixed astigmatism. Implantation of multiple iStents into Schlemm’s canal with injection of dye to assess patency to distal outflow system. This MicroInvasive Glaucoma Surgery (MIGS) device is the first of a number of exciting new surgical options for glaucoma. Amar Agarwal, MD, introduces pre-Descemet's endothelial keratoplasty, a variation of the DMEK procedure that appears to incorporate the newly discovered Dua's Layer of the cornea into the donor graft. This is an implantation of a modified capsular tension ring (Morcher Type 10C Henderson Ring). The area of zonular weakness is stabilized with capsular hooks. The capsular bag is inflated with viscoelastic solution. The modified CTR is injected into the eye, aiming towards the area of weakness. The final trailing eyelet is carefully released into the bag. This is a myopic gentleman of 66 who had cataract surgery in the right eye over a year ago. There was a radial tear in the anterior capsule and the lens, a silicon Tecnis Z9002 was placed in the sulcus at that time. Since then, he has developed pigment dispersion glaucoma uncontrolled on maximal medication for which he was referred to my practice. The anterior capsule is missing on the nasal side for about 3 clock hours (from 2 to 5 o’clock) where the radial tear out occurred and the capsular bag is collapsed and fibrosed under the IOL. A decision was made to reposition the IOL in the capsular bag and perform trabecular aspiration to reduce the pigment load on the meshwork. Treatment with transepithelial PRK of residual myopic astigmatism. Tyler Q. Kirk, MD, narrates a case demonstrating the simplified scleral fixation technique for dislocated in-the-bag IOL developed by Garry P. Condon, MD. Thomas Oetting, MD, performs the IOL scaffolding technique in a patient with a dense mature cataract. Ophthalmologist Keith Walter, M.D., at Wake Forest Baptist Health, demonstrates how the Catalys Precision Laser System works while performing cataract surgery. The arc patterns of 39 spots rotated automatically after each laser application so that the new pattern was applied at an untreated position. All you have to do is rotate the contact lens to adjust the aiming beam on the trabecular meshwork. With SLT, you have to remember where you put the spots, but with PLT, you do not miss any spots because the software is designed to cover the entire area of trabecular meshwork, according to Miho Nozaki, MD. Sony Goel, DNB, presents two cases—one with anterior lenticonus without Alport syndrome and another with anterior and posterior lenticonus that underwent clear lens extraction by phacoemulsification with multifocal IOL implantation. Harminder S. Dua, MD, PhD, describes how air is injected into the stroma of a sclera-corneal disc through a 30-gauge needle. Tiny bubbles permeate through the stromal layers until they reach the posterior surface of the cornea and lift it up in the form of a big bubble. Descemet’s membrane can be peeled off without deflating the bubble. When the Descemet’s membrane is peeled off, Dua's layer, which is transparent, tough, and impervious to air, is revealed. Kevin Waltz, OD, MD, presents a complex case of a patient with a very small pupil and a dense cataract. In addition, the patient presented with posterior synechia and a functioning bleb. Healon EndoCoat was used to control the anterior chamber and maintain dilation during phacoemulsification. The viscoelastic was able to maintain a stable chamber through significant manipulation of the pupil, due to large nuclear segments. Intracameral moxifloxacin is injected, as the final step in cataract surgery, through the side port, after hydrating the primary incision. The IOL is depressed during injection so that the antibiotic is delivered into the capsular bag, the avascular sequestered space where the IOL has been implanted. As the cannula is withdrawn, injection is continued so that the eye remains pressurized after the cannula is withdrawn. One option is to hydrate the side port incision as the cannula is withdrawn, to doubly assure AC pressurization. This video shows making a new side cut with the femtosecond laser for a LASIK enhancement. Notice the original side cut is marked with a surgical marking pen and the new side cut diameter is programmed within the old one. The depth of the cut is set to transect the old lamellar interface. The flap is then lifted and excimer laser retreatment is performed. This technique is useful to reduce the rate of epithelial ingrowth in LASIK retreatments that occur more than 3 years after the original LASIK surgery. Limitations of the technique are the diameter of the original flap and the ablation pattern needed for retreatment. Dr. Lee performs a deep anterior lamellar keratoplasty (DALK) for severe stem cell deficiency from contact lenses and keratoconus. He demonstrates how to form the big bubble and offers tips for achieving the big bubble and tools that are ideal for use in this procedure, including blunt scissors to avoid puncturing or perforating Descemet’s membrane. This patient is in his mid-70s presented with a cataract so dense it had become very difficult to visualize the fundus. This is a typical patient in her mid-60s with declining vision found to be consistent with a visually significant cataract. Steven G. Safran, MD, presents a case of a patient with a Tecnis multifocal placed in the sulcus who had pseudoexfoliation syndrome and iris chafing causing a pigment dispersion type glaucoma. A decision was made to replace the IOL with a monofocal silicone lens for optical reasons to reduce the likelihood of chafing. Trabecular aspiration was also performed to clean out the angle and reduce the IOP. This was successful, reducing the patient’s IOP significantly and thus avoiding the need for further surgery. Iris retractors were placed to improve visualization and the capsular bag was reopened using a 26-gauge spatulated LASIK cannula with dispersive viscoelastic. The point of entry into the bag was the point of exit of the CTR. After the capsular bag was reopened the CTR was removed through a temporal incision and then redirected into the capsular bag where it was placed 360 degrees after reinflation of the bag. At this point the IOL was retrieved and the superior haptic sutured to sclera while the optic was buttonholed into the capsular bag. Although the IOL appeared stable at this point Dr. Safran was concerned about some possible tilt due to the lack of inferior zonules, and it also looked under the microscope like there was a rather large gap between the inferior part of the IOL and the back of the iris. Dr. Safran was concerned that this could lead to a hyperopic outcome and induce some astigmatism so he decided to lasso the inferior haptic above the capsular bag to the CTR within it together to sclera. Cynthia Matossian, MD, does a side-by-side comparison of toric IOL implantations.